SCHUETZ DSL will be exhibiting at stand 53 at this year’s Bulkex exhibition being held on the 25th-27th September at the Melbourne Exhibition Centre. 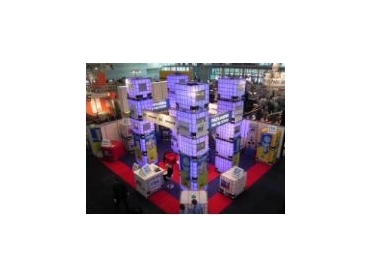 Visitors to the stand will see the eye-catching illuminated IBC towers, which are now synonymous with DSL Packaging. The entire range of industrial packaging options will be showcased, including the world leading SCHUETZ Intermediate Bulk Containers, or IBC's, SCHUETZ plastic Ecodrums as well as a full range of accessories. SCHUETZ ECOBULK intermediate bulk containers measure one cubic metre and consist of a high density polyethylene blow moulded inner bottle surrounded by a galvanised steel cage, which is mounted on either a steel, plastic or wooden pallet for easy handling. IBC's are designed for the packaging of liquid products and are UN approved for the packaging of dangerous goods in groups II and III, making them suitable for the chemicals and solvents industries. The units are also FDA approved for the packaging of food and beverage products including oils and fats. Also on show will be the latest innovative security layer technology designed by SCHUETZ headquarters in Germany. This involves the application of as many as six different protective layers within the blow moulding process of the HDPE (high density polyethelene) IBC inner bottle. The specific properties of these additional layers are expected to offer new possibilities for plastic packaging applications, particularly the aromatic hydrocarbon and solvent industries, and many food products where permeation has previously been an issue. The 1000L units are now used extensively across Australia and parts of Asia, and SCHUETZ DSL also offers a worldwide collection service as part of the SCHUETZ Ticket, and a unique responsible care system that ensures the recycling and re-use of the units globally. SCHUETZ DSL manufactures the ECOBULK range of IBC's from Melbourne in Australia and Kuala Lumpur in Malaysia. Refurbishing facilities are also located in Perth and Brisbane with other office locations and full service support in Sydney, Auckland and Jakarta. All units include worldwide collection, storage, laundering and recycling. For more information on any of the SCHUETZ ECOBULK range and other DSL Packaging products and services, visit stand 53 during the 3 day event or visit www.dslpackaging.com.